Wooden dining chair with wood finishes in a choice of fourteen colours and a faux leather seat in a choice of 16 colours. High quality chairs delivered assembled and ready to use. 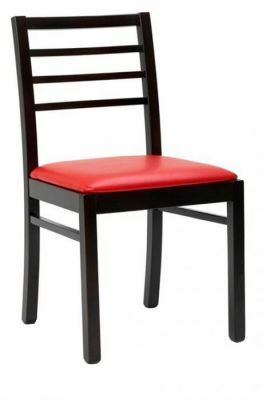 Elegant design dining restaurant chair with an attractive back and upholstered seat in a selection of attractive coloured faux leathers. You can expect a lead time of up to three weeks with this order.